Quintessentially British design and exquisite craftsmanship combine with the vintage-inspired Emmy London collection. 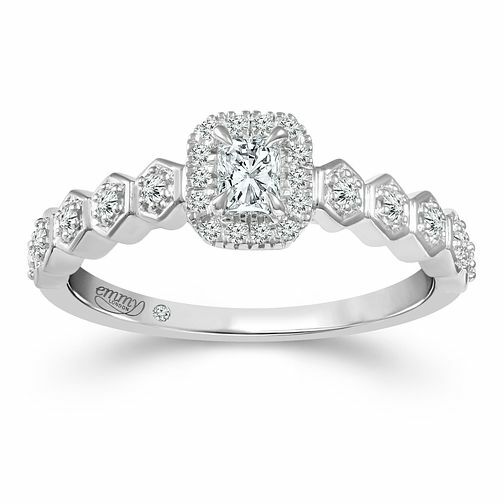 This dainty diamond ring is set to capture hearts, not to mention the light from every angle! The stunning shoulders present shimmering diamonds set within hexagonal frames, leading to the captivating centrepiece. A beautiful radiant-cut diamond surrounded by a glistening halo. A hidden diamond is set within the band beside the Emmy London signature. A sentimental and stylish ring to represent your love, with a total diamond weight for this ring of 0.33ct.